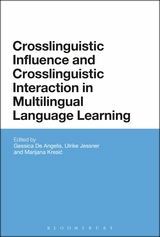 Book publication: "Crosslinguistic Influence and Crosslinguistic Interaction in Multilingual Language Learning"
De Angelis, Gessica/Jessner-Schmid, Ulrike/Kresić, Marijana (eds.) (2015): Crosslinguistic Influence and Crosslinguistic Interaction in Multilingual Language Learning. London: Bloomsbury. Blurb: "Which strategies do multilingual learners use when confronted with languages they don't know yet? Which factors are invloved in activating prior linguistic knowledge in multilingual learning? This volume offers valuable insights into recent research into multilingualism, crosslinguistic influence and crosslinguistic interaction. Experts in the field examine the role of background languages in multilingual learning. All chapters point to the heart of the question of what the 'multilingual mind' is. Does learning one language help you learn another, and if so, why?" Enrollment for the single mayor and the double mayor study program "M.A. in Linguistics"
At the beginning of October 2017, 15 students are enrolled in the single mayor and 15 students in the double mayor program "M.A. in Linguistics" at the Department of Linguistics at the University of Zadar. The full amount of the study fees can be covered by the Croatian Ministry of science, culture and sports. Please do not hesitate to contact us via telephone (+385 23 200824) or via email (lingvistikaATunizd.hr) if you have further questions. More detailed information on the enrollment is published on the webpages of the University of Zadar. Book publication: Modalpartikeln: Deutsch im Vergleich mit dem Kroatischen und Englischen/ Modalne čestice: njemački jezik u usporedbi s hrvatskim i engleskim.